I fish with soft plastics more and more for species such as bass, wrasse and pollack. Here are the ones I use the most. I tend to fish the 6’’ version weightless (i.e. no added weight, just a weedless hook around the 5/0 or 6/0 size) and you’ll be somewhat surprised at how well this thing casts. It flies !! The proof is in the pudding – check here. I wrote another blog post about this lure here and here. My favourite hooks for these lures in the 6'' size are the Owner Twistlock Gary Yamamoto Spec, either size 5/0 here or 6/0 here. You can usually find good UK stocks of these lures here. Now available in white, check here. Soft plastic of the year 2018. My go-to paddletail, and it has been for a few years now. 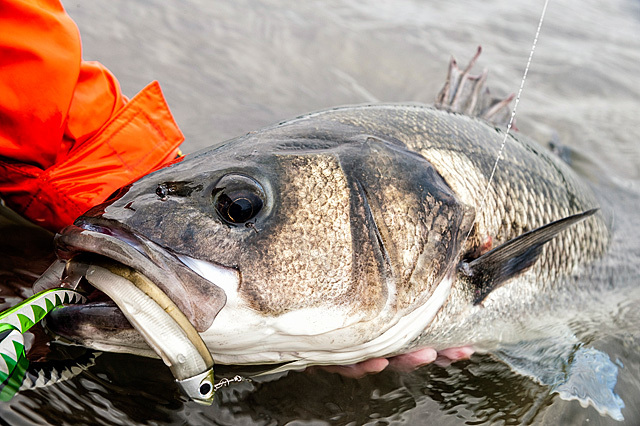 Bump it down the tide, swim it like a minnow, vertical jig it, do what you want, bass seem to love it. Oh, and pollack do as well - big time !! These bass here were caught on the Black Minnow - need I say more ? You can usually find good UK stocks of these lures here and here. I love this weight of jig head and length of body from the Fiiish Black Minnow series for bumping down the current in estuaries etc. The 20g Shore Head that is designed to fit with the 140mm Black Minnow body makes for a great combination with my favourite shore fishing 120mm size body. I turn to this in rougher conditions and stronger currents as it gives me more control. I could of course use the 25g Off Shore Head that is meant for the 120mm body, but I like the shape and lighter weight of that 20g Shore Head and the way it behaves when I am shore fishing. And it works - check here. I am ridiculously excited about this Black Minnow combination. OK, so this 140mm body rigged on the 10g Shallow Head is not exactly a distance weapon, but I am thinking about so many different situations where I might use this particular Black Minnow. Swim it, bump it along and just off the bottom, sink and draw with a slower fall rate than the heavier heads, I could go on. With “Le Crazy”, it’s all about getting that speed right on the lure to get the body undulating - it’s designed to be fished fairly fast. Check out some bluefin tuna fishing on the Crazy Sandeel here, and a report of mine here on the first bass I caught with it. The Crazy Sandeel should be illegal for pollack it's so deadly! A killer paddletail in some killer colours. Not cheap, but then MegaBass lures never are. 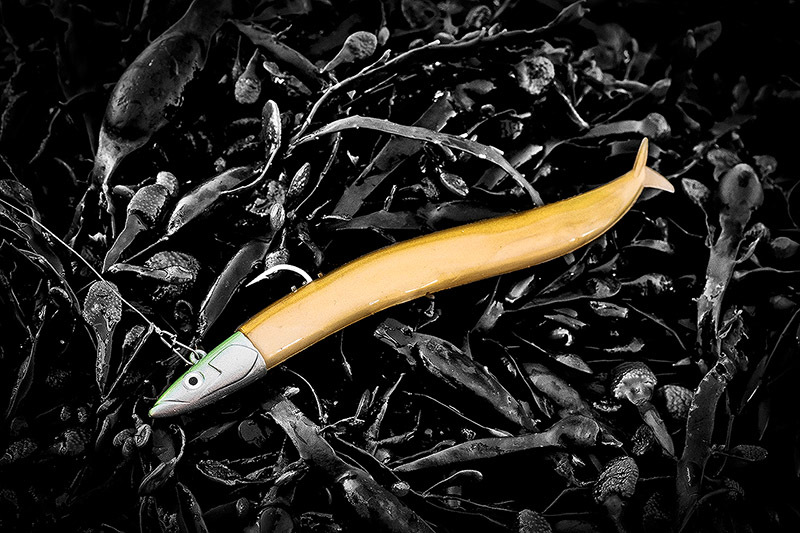 As a paddletail to swim nice and shallow and subtly, the 5’’ Spindle Worm is lethal for bass. These Gamakatsu belly-weighted weedless hooks here fit these soft plastics really well. I particularly like these hooks here and here for this lure. A simple looking, long casting soft plastic from the US, the Albie Snax in the 5’’ size especially has accounted for a lot of good bass here in the UK and Ireland. I am starting to really like the White Pearl colour for night lure fishing. You can get them here in the UK. I have been rigging mine on a 6/0 weedless hook either weightless or with a small belly weight – they cast incredibly well and when you straight retrieve nice and slowly these Fish Arrow Flash J 5’’ soft plastic lures (5’’ long, 11g) swim just beneath the surface with the most stunning kind of lazy, “S”/slalom action. I nailed bass on them almost immediately doing this. You can find these lures here in the UK. Wow does this Fish Arrow Flash-J Shad 5'' move beautifully in the water. A slow to medium speed retrieve on a belly-weighted weedless hook (I really like this particular hook here on this lure) really gets this paddletail working away. Fish it nice and slow like the regular Flash J or twitch it around more like a DoLive Stick, and I really fancy this new Fish Arrow Flash J Split SW 5'' (13g) to nail the bass. I can’t get enough of these Wave Fishing 5’’ Bamboo Stick senkos, and I especially like the white ones for fishing at night and when there’s a bit of colour in the water. Often known as Wave Worms here in the UK and Ireland, these heavy senkos cast like missiles - they are about 15g when rigged on a weedless hook - and they survive repeated casting really well. 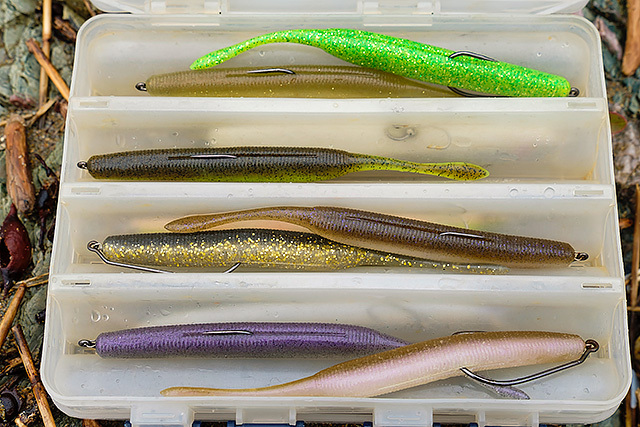 Check here for proof that these simple looking lures work! You can usually find good UK stocks of these lures here. 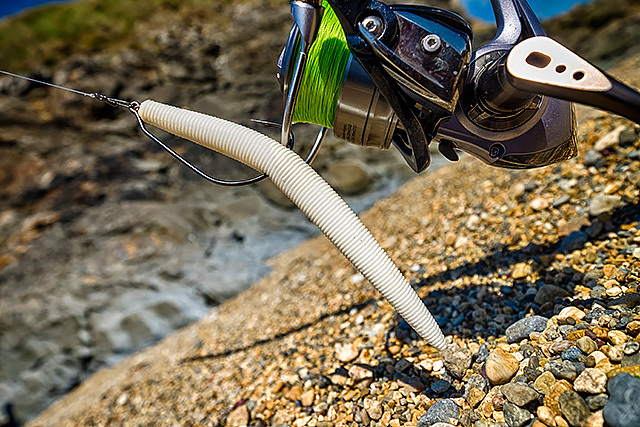 An interesting soft plastic that I think offers an alternative to the lethal OSP DoLive Stick. This Deps Deathadder 6'' (15g when rigged weedless/weightless) looks like it’s doing largely similar things to the DoLive Stick when you fish it with that deadly twitch, pause, twitch kind of retrieve. 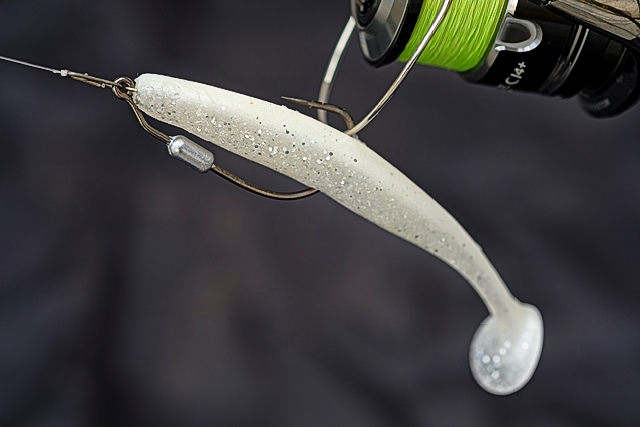 You can find this lure in the UK here and also here, in white as well. Yes! A soft plastic lure that I am sure needs no introduction at all for a lot of bass anglers, but to be honest I have only started using them recently, and especially the 22g size. Most of my fishing with these Savage Gear Sandeels so far has been a case of simply whacking them out and winding them in at different speeds to try and control the depth they are fishing at. You can usually find good stocks of these lures here in the UK. A classic 6'' long senko style soft plastic that work so well for our bass, and I especially like the white ones for night fishing. You can find them here in the UK. Along the lines of the OSP DoLive Stick, this 6’’ 12g MegaBass Cattle Tongue works well when fished weightless as a soft plastic jerkbait. It casts very well, it’s remarkably “stable” in the water for a soft plastic fished with no added weight, and your wide-gape hook sits down nice and weedless in the slot on the back of the lure. The MegaBass DOT Crawler flies like you would not believe, indeed I have personally never come across such a soft plastic that can be rigged weightless and casts so ridiculously well. It was no great surprise that bass would like a lure like this – see here. A top of the range soft plastic lure that is does serious damage on the bass. 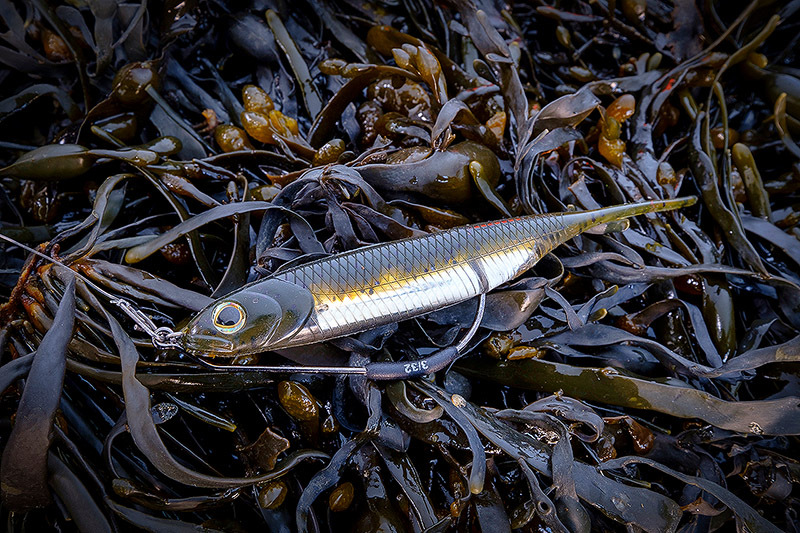 Try twitching the MegaBass XLayer almost like a hard minnow type lure, gently "bounce" them on and off the bottom as you retrieve it, or simply let them trundle down in the current. Bass seriously kill these things. I defy any lure angler not to stare open mouthed at these stunning OSP DoLive Shads moving through the water on a slowish sort of retrieve - wow! Some friends of mine have hammered bass on the smaller 4.5’’ size especially, fished with a belly-weighted weedless hook (I really like the Owner hooks here), and they cast incredibly well, swim lovely and shallow, and that tail just thumps away. Same with the bigger 6’’ version. Another killer soft plastic from OSP. You can buy these lures here in the UK. It’s the 4’’ and 4.8’’ versions that I have fished with the most, and I can’t recall coming across a paddletail that you can swim this slowly yet which gives off so much movement. These TT Shads are something else - they cast well, and I tend to rig them on a belly-weighted weedless hook and swim them nice and shallow.